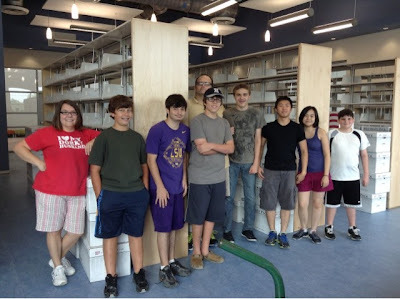 Today I had to pick up 97 boxes of new library books from a school 15 minutes away from the new PFTSTA. The boxes weighed anywhere between 20 and 50 pounds. I wanted to make this move in one trip, but I wasn't sure it was possible. On our school's brand new Facebook page, I put up a notice asking for help. I had parents, students and even alumni offering to give me a hand. I didn't know how many vehicles and muscles would actually show up. The plan was to meet early this morning with our hand trucks to try and avoid the heat of the day. With seven trucks, vans and SUVS and about 15 people and 6 dollies, we got the vehicles loaded in less than hour. We got to the new school and repeated the process of moving the boxes into the new library. I love working at Patrick Taylor. When you need help, the cavalry arrives. Now we have 2400 of brand new books to add to our collection. They aren't processed. Anybody available to volunteer some time to get these books shelf ready?